“As advocates for people living with HIV, we have dedicated our lives to combating this disease and no longer feel we can do so effectively within the confines of an advisory body to a president who simply does not care,” they wrote. The group noted that Trump took down the Office of National AIDS Policy website when he took office and hasn’t appointed anyone to lead the White House Office of National AIDS Policy. They also said that the GOP’s ObamaCare repeal bill will dramatically hurt those with HIV/AIDS, making it the “final straw for us — more like a two-by-four than a straw” in deciding to leave the council. Is your favorite local business on the Equality Means Business list? If not, ask them to add their names! Equality Loudoun is PROUD to be participating in the Town of Leesburg 4th of July Parade! Sign up to walk in the parade with us- our pride and patriotism will be on display! All LGBTQ+ friends, families are welcome! On this day we remember the 49 lives lost in the Pulse Nightclub shooting and the many other LGBTQ lives silenced by violence. Even without the Pulse victims, there was a 17% increase in hate killings from the previous year. We had a great turnout for last night’s relaunch of Equality Loudoun. Thank you to everyone who came out last night! Also, big thanks to Equality Virginia for all your help in supporting us. 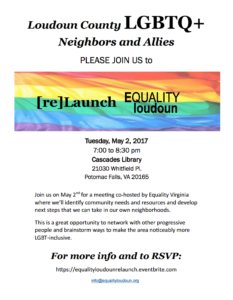 We are so excited to announce that we have an official flier and an eventbrite link for the May 2nd Equality Loudoun [re]Launch/Community mobilization event. Here is the link to register at eventbrite. EVEN IF YOU HAVE RSVP’d via facebook, PLEASE register on eventbrite. That will be our formal count as the space is limited. We are thrilled to announce that Equality VIrginia is helping us re-launch a local LGBTQ+ education and advocacy network in Loudoun County. We will be having a meeting Tuesday, May 2nd, 7 pm to 8:30 pm at Cascades Library in Sterling, VA. At this meeting, folks from Equality VA will be leading us through a process of identifying our community’s resources and challenges in the work to create a more equal and hospitable environment for our LGBTQ+ friends and neighbors. Everyone is invited. Please spread the word.